Healing, Family and Fun - One of the most important things you can do when you want healing in your body is to imagine it and see it happening on the inside in your thoughts, dreams and imagination. It's been said that "until you can see it on the inside, you can't see it on the outside." We all have a picture of who we are in our own minds planted at the very core of us. Unless you renew your mind, you never rise above that picture. If you've had health problems all your life you tend to become the disease ... you see yourself always compensating for the symptoms, etc. That's something you need to dispel. I've made a long list of things I want to do when I am totally healed. Riding a bicycle was on that list. I can't remember being on one since I was in my early 20's. I know I will need strong thigh and calf muscles and definitely my new heart for the ability to have any kind of endurance. Back in April I wanted to go somewhere overnight to celebrate our 38th Wedding Anniversary and also for Resurrection Sunday. I chose something a couple hours from home. One place I wanted to visit was First Landing State Park because they had a rather desolate beach within the park. Lying on a beach is another thing I've wanted to do since it's been around 35 years since I'd laid on a beach. I thought it the perfect place to focus on the Cross, Burial and Resurrection of Jesus with some meditation time. Seeing Jesus on the Cross taking my sins and my diseases and then tossing them back at the devil when He was resurrected is another great imagination / meditation topic to sink into your heart. We know it in our minds, but our hearts need to understand it emotionally. 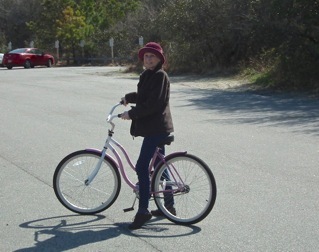 One of the staff at the Visitor Center happened to mention the park had bicycle rentals. When we drove down to the Gift Shop and saw the bicycles outside I instantly decided I wanted to do it. It had the old brakes that were in the pedals so I could break with my feet instead of my hands. The rheumatoid arthritis damage prevents me from bending my middle knuckles, so it seemed all things were go for the event. Until I got on the bike .... as I thought "you never forget how to ride a bike" and noticed it was true after a shaky minute or two. I had hoped I could ride down one of the trails, but barely got off the curb into the parking lot without stopping. So I took it easy riding a few minutes and stopping a few minutes (okay, maybe it was only 1-2 minutes). 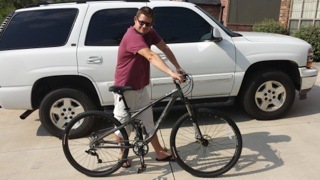 It was exciting just to be standing and holding a bike. After spending 20 minutes starting and standing in the parking lot, we returned the bikes with my heart racing and were very pleased with the experience. I definitely had a clear mental picture of me riding a bicycle and the improvements I needed to make. The lady was so kind to even refund the portion of the rental we didn't use. The Fun Part - We'd given our son a bike a couple years back on his birthday and I'd said many times that we were going to ride bikes together when we met on one of our vacation trips that we've not done since my heart interruption. To have a better mental picture of that, I asked my husband if he could put two different pictures together with PhotoShop so it would look like Ben and I were riding bikes at the State Park. Our son lives in Oklahoma. I had a photo of him with his new bike and a photo of me at the park. PhotoShop is not something my husband has used much but he's always up for a computer challenge and he did a great job since he had enough patience to get the shadows, car and black tires out of the picture. The Challenge! Look at the three photos at this link and answer my question: What do you think looks strange in the end result photo? Enter your comments at the photo gallery. Tidbit - Bomb-Sniffing Rats - Alert: None get killed and it's certainly a job better than being a lab rat. Land mines require about 11 pounds of weight to explode and these rats weight about 3.3 pounds. Fresh air, sunshine, treats and getting to know people as friendly beings. Sounds like a good trade-off to me! In 2013, it was estimated that there was a global average of around 9 mine-related deaths every day. The situation is especially dire in Africa. An organization in Tanzania trains African Giant-pouched Rats to detect landmines and even tuberculosis and it's saving many lives. They used this rat because it has an incredibly fine-tuned sense of smell and a long lifespan (8-9 years) to yield returns on the 9 months of training they undergo. Check out the whole story. Insects - Pollinators - These are most likely sweat bees, which is a common name for a very large family of bees that are .12 to .40 inches long. At that size, they're hardly visible to the human eye as far as details of what it may look like. That's why I love the macro lens feature on cameras. These bees are usually metallic or black. 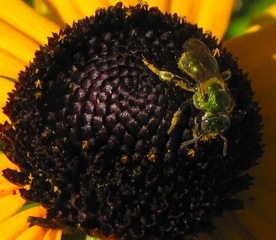 I photographed two bees that could be sweat bees due to the size and colors. They are actually native bees to the United States and are among the most common bees where ever bees are found (except in Australia). There are about 1000 species of them in the USA, Central America and Canada. They sting only if handled. They gather pollen on their legs as other bees do. Most nest in the ground, but some in wood. In some species, the bees constantly guard the nest entrances. A wide range of social development is displayed in the family and many insights into social behavior among insects have been learned from sweat bees. The Alkali Bee is a somewhat unusual ground-nesting sweat bee native to western U.S. arid regions. It's black with pearly bands on the abdomen. This bee forages on a wide variety of flowers but is particularly attracted to alfalfa which it pollinates very efficiently. Commercial alfalfa seed growers use the Alkali Bee for pollination in parts of the West by constructing or maintaining Alkali Bee beds to cultivate thousands of bees. 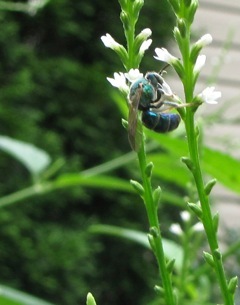 With the concern about pollinator die-off, we love seeing every little pollinator we can view in our garden. Some days we could title our yard, Busy Bee Garden. They seem to be everywhere. It's incredible how many varieties of bees there are. TIDBIT - Highway Safety - Thanks, Charlene, for sending the link to the 2-minute Samsung Safety Truck video. When driving behind big tractor trailer trucks, people take risks to pass them because they have to first move left to see if the road is clear ahead before passing. This is particularly dangerous on single-lane highways because it can mean driving into the path of oncoming traffic. Samsung Electronics has come up with a way to help reduce this problem by mounting cameras on the front of a truck and large screens on the rear to display to following drivers a clear view of the road ahead. This works day and night and also allows drivers to see road hazards ahead in time for them to react. It was tested in Argentina (see video) What an awesome idea! Right now their working on making the technology comply with appropriate road authorities for use on the highways. View the video. Birds - All the birds are about finished with parenting roles it seems. The little ones are growing up learning a whole new world. 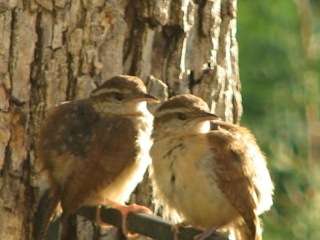 I still enjoy the Carolina Wrens the most. They are such cheery joyful birds. They have the loudest song for such a small bird and when on the rail post it comes with a dance, the flipping of that tail as it sings away. I always say they are praising the Lord when they do that! I wish I had captured a video of it. I've seen it many times, but am always so love-struck with this little one's enthusiasm I'm not even thinking camera. That's definitely unusual. We've had some juvenile American Crows. It was interesting to see them exploring the world. You know they've been nominated many times in research as the most intelligent bird. We enjoy our crows since the family chases hawks away from our property. It's a God-thing I'm so sure. We love the hawks and they can have the backwoods behind our lot ... and I won't complain about "lost" squirrels or frogs, but I can't tolerate them chasing my songbirds right before my eyes. Fortunately I've not seen a bird catch. But our pond has many frogs and if they weren't "helping" with the squirrel population, it wouldn't be a good thing since squirrels have many times done damage, but I still love them and want them here in not-so-high numbers. I always remember the short video about Crows Using City Traffic to Crack Their Nuts. Spiritual - Doubt is a tool that Satan and even our own minds use to keep us from walking in the victory we've been given through the Cross. That was the tactic Satan used when talking with Adam and Eve. He wanted them to doubt what God had said.